No vintage wedding would be complete without the perfect groom’s outfit. The trouble is that while it can be relatively simply to find the perfect vintage bridal dress, finding the right attire for a vintage groom could be more challenging. A lot of people seem to take the view that “a suit is just a suit” however we don’t believe that should ever be the case. The groom’s outfit is every bit as important as the bride’s dress, and finding something that fits seamlessly into the theming of the day is key to its overall success. That’s why here at Fur Coat No Knickers, we’ve embraced the challenge that faces grooms out there today, and have gone all out to find the best ideas for the various eras that you may wish to replicate on your big day. Whether you’re going for the roaring twenties or the elegant fifties or anything in between, we’ve got brilliant suggestions for you that will give you all the inspiration you need. If you imagine Al Capone, you won’t go far wrong when it comes to dressing the groom for an elegant 1920s themed wedding. You can find some historically accurate “Oxford Bags” – a style of loose trousers with pin striping and turn-ups with the obligatory crease to the back and front, and then pair them with an informal blazer or jacket with sloping shoulders and a fitting cut. Of course, two-tone brogues are virtually mandatory, with a smart shirt, tie and the classic fedora for a final touch. The look of the thirties is best summed up in veteran actor Cary Grant. Tweed is the ultimate look here and will look absolutely perfect in a 1930s style wedding. If you’re opting for a formal style wedding, a “London Drape” suit would be perfect. This style is characterised by its boxy fitting, double breast lapels, extra room in the chest and then fitted waist. Alternatively, if you’re keen for a more informal look – a la jazz set – the zoot suit could be perfect – characterised by its oversize jacket, huge lapels and padded shoulders together with pegged, loose, high waist trousers. The war years meant that less fabric was able to be used in making clothing, so the 40s version of the zoot suit was more plain and functional. You definitely need to pair these trousers with braces as they were in high fashion at the time (probably because the leather used to make belts was being used for the war effort). 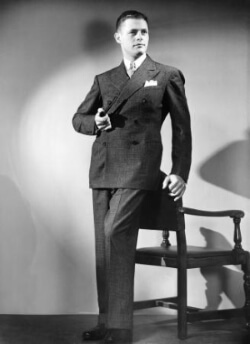 If you’re going for later 1940s style, the swing style double breasted long jacket paired with wide trousers would be more appropriate – think Gene Kelly. Ties are very important for this era, and you can go patterned or colourful. Check out our favourite ones. A traditional 1950s suit should be dark and conservative, although a narrow brimmed hat and slim tie are essential accessories. This is an easy look to emulate – if you imagine Frank Sinatra in your mind’s eye you won’t go wrong. Alternatively, if you’d rather go for something a little more unique, you could always opt for the Teddy Boy look! Of course, there’s nothing to say that you can’t opt for a later vintage era for your wedding. The 1960s has some wonderful style ideas, and if you’re going for something informal, a 1970s event complete with flares and kipper ties could be absolutely perfect. A perfectly dressed groom is key to your special day. After all, there’s no reason why all the attention should be on the bride! So, if the happy couple are working in tandem to take their theming right through their special day, this helpful guide to men’s fashion through the eras should make it a lot easier to source the right groom’s attire. There’s no need to actually buy vintage, although that may be the authentic approach you want to take. Quite often, you can find vintage themed pieces on the high street that work perfectly as part of a vintage wedding ensemble, especially when it comes to shoes, braces, hats and ties. Choose wisely, and your vintage wedding will look perfect from start to finish!